Then there come that other Adam, which was Christ, never a one like Him! Somebody say He wasn't God? His uniqueness proved He was God. There never was a creature lived like Him. He lived in a world to Himself. He was born outside of the realm of the natural, sinful man. Hallelujah! He was the Creator Himself made flesh. Who could ever stand where He stood? Who ever talked like Him? Who could ever say the things that He said? Who could ever do the things that He done? 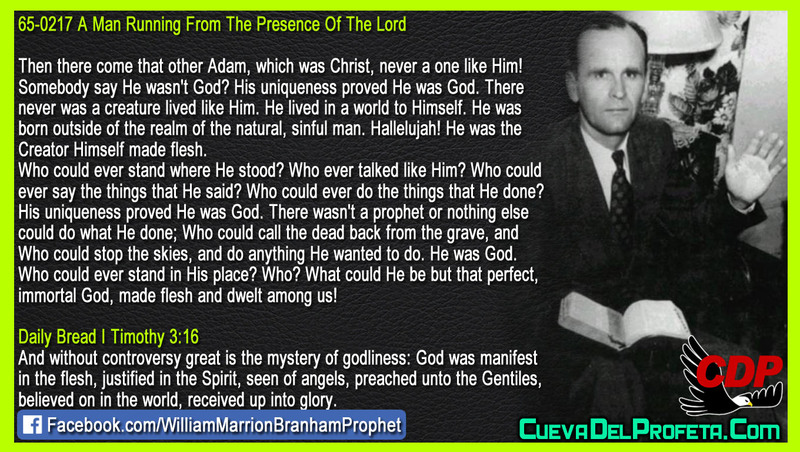 His uniqueness proved He was God. There wasn't a prophet or nothing else could do what He done; Who could call the dead back from the grave, and Who could stop the skies, and do anything He wanted to do. He was God. Who could ever stand in His place? Who? What could He be but that perfect, immortal God, made flesh and dwelt among us!